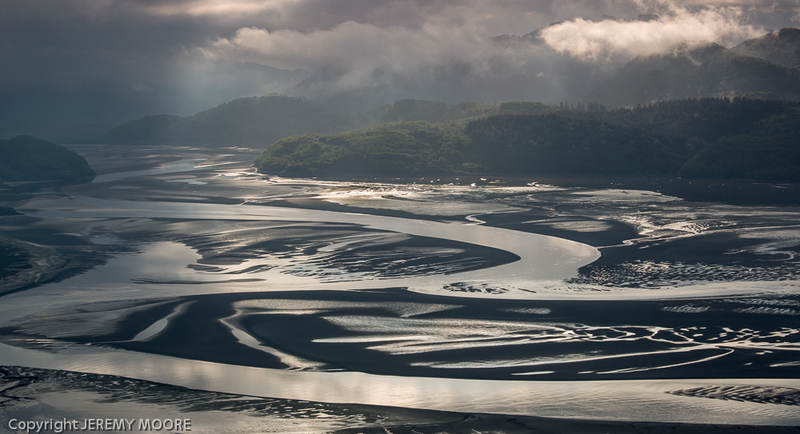 What a difference an hour makes…..
Mawddach estuary at 7 am. 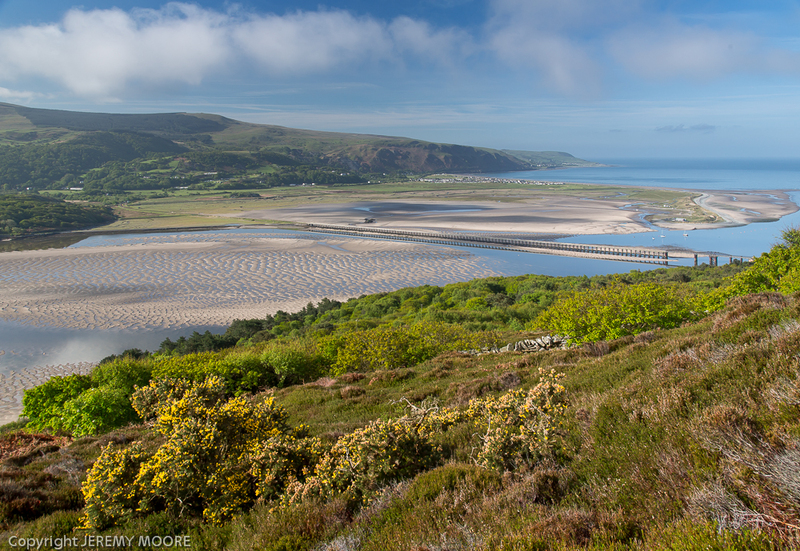 After doing deliveries around north Wales on Friday I had the day free on Saturday for photography. Friday had been damp and drizzly with plenty of low cloud but no wind. A continuation of the calm conditions overnight coupled with the passage of a cold front suggested that better times would soon come. I guessed that there would be plenty of “interesting clouds” to photograph the next morning. I sat out Friday evening and then drove down to the Mawddach estuary to arrive just before dark. I could see that the low cloud had aligned itself in distinct layers along the steep sides of the estuary although it was too dark to photograph it. I set my alarm for 5 a.m. I didn’t want to miss a thing! I had parked up by the side of a minor road near Barmouth with a view right down the estuary and across to Cadair Idris. Groggily I crept out of the van to find that the cloud had coalesced into a huge amorphous blob with no photographic potential whatsoever. Although it was cloud-free to the west it would take the sun quite some time to rise above the blob. Time to enjoy the birdsong and make a leisurely cup of tea. I decided to head for the Panorama Walk above the head of the estuary. At least I’d get some exercise! The cloud was very slowly drifting downstream above the estuary and lifting. Would the sun ever break through to light up the landscape? I felt sure that all over Snowdonia photographers were making amazing images but that here it was no-go time. At last, at 7 a.m., a few gaps appeared and a dramatic scene was revealed (see top picture). Although the clearance lasted only a couple of minutes it had been worth getting up so early. I turned my attention south- and west- wards. The tide was out, revealing beautifully patterned sandbanks; river channels reflected the blue sky as they coiled through the sand. I floundered through deep heather and young gorse to a lower viewpoint closer to the river. The brilliant young greens of oak woodland appeared. Even a gorse bush in full flower. This landscape had everything other than sunlight to illuminate it. I was close to prayer. And then, exactly an hour after the first short clearance, the cloud receded inland to allow the sun to appear. I took a series of images and stepped back to admire the view for its own sake. I used a polarising filter to saturate the colours and a one-stop graduated ND filter to hold back the sky a little. It is sometimes said that a one-stop grad is virtually useless but I find that in conjunction with a polariser it gives perfect, natural-looking skies. This may be a conventional image in many ways but for me it sums up the beauty of the Welsh landscape at the most stunning time of year. And I need new images of the Mawddach estuary for postcards. Job done! This entry was posted in Uncategorized and tagged dawn, estuary, filter, graduated, landscape, mawddach, ND grad, one-stop, photography. Bookmark the permalink. 2 Responses to What a difference an hour makes….. Thanks Brian, nice to hear from you. 5 am was a bit much!